This is what a correct honor looks like. We see so many lousy honors, we were inspired to post what a correct, stylish one looks like. If I were to nitpick, I would say it could be improved upon if Trip (the honoring Vizsla) never took her eyes from Amante (the Vizsla on point) and if I didn’t have to give even the quiet, reminder “whoa” when Trip sniffed the ground and looked around briefly. The backing/honoring dog (Trip a Vizsla, CH Boulder’s N Fusion’s Power Trip SH) did what she’s been taught to do all on her own without a command or any stimulation from her ecollar (yes she is wearing an ecollar and yes, we train all of our hunting dogs with ecollars). No gimmicks (okay–some might argue this and say the ecollar is a gimmick–whatever! ), no screaming or hollering from us, just clear and concise training has given Trip the ability to understand what she needs to do when she comes across a “standing” or pointing dog. She honored with all sorts of style. The ideal honor/back should look like the dog is on point–there should be that much intensity and style in an honor. Dogs who lose style when honoring usually have been “intimidated” (whether by physical force or mental pressure/mind games) into complying. The honoring dog is staunch–she doesn’t look as if she might “break” her honor or come off to try and steal point. We’ve worked up to this in training but you’ll also notice we weren’t rushing in to get to either dog. We walked with purpose but weren’t in a hurry. Though the video clip doesn’t show it, Amante (CH Boulder’s Bolder Amante SH) had been on point almost a full minute before I started the camcorder. Trip had been hunting hard out beyond where Amante was standing on point. As she turned, she saw Amante standing and stopped hard in an honor. They were both way too far away and the wind was too strong for our voices to have carried. Had we even tried to give any commands, they couldn’t have heard us. So, how do we get such nice honors? By following the methods Jon and Cindy Hann teach in The Perfect Start and The Perfect Finish videos. Their method of teaching honoring is so incredibly easy! You must have solid foundation work in place though, before being able to train an honor using their methods. Pointing dog (Vizsla) is "Kosmo"/CH Derby's Read Em And Weep MH. Honoring dog (Vizsla) is "Amante"/CH Boulder's Bolder Amante MH. This is a good example of a true honor. Look carefully at the pointing dog's eyes--they're shifted indicating the bird is to his left. Though out of focus--look at the honoring (or backing) dog. Her eyes are on the pointing dog--as they should be. Moments before she honored (on her own, without a command as should be at the "Master Hunter" level) her head was down, nose to the ground as she hunted. She glanced up and saw Kosmo on point and stopped hard in her tracks to back. At the "Master Hunter" level (or "finished" level), the pointing dog will stand steady as the bird is flushed and shot. This is referred to being "steady to wing and shot". Only when he's given the signal to retrieve will he break. Then, he must retrieve "promptly, tenderly, and absolutely to hand." The honoring or backing dog will stand through the entire flush, shot, and retrieve to hand and will not move until released to hunt on. Pretty cool! Why should you care about teaching your gun dog to honor? Perhaps, the biggest reason would be when hunting over multiple dogs honoring/backing prevents rude behavior like stealing points. Another reason for teaching a dog to honor is if you have an interest in playing AKC hunting test and field trial games. Dogs aren’t required to honor at the Junior Hunter level but they are when they’re testing at the Senior and Master Hunter levels as well in Gun Dog stakes (field trials). Words of caution: Please don’t try to train your puppies or baby birds dogs to honor like this. If you work the Hann’s program at your pup’s pace, you’ll know when s/he is ready to start learning how to honor. 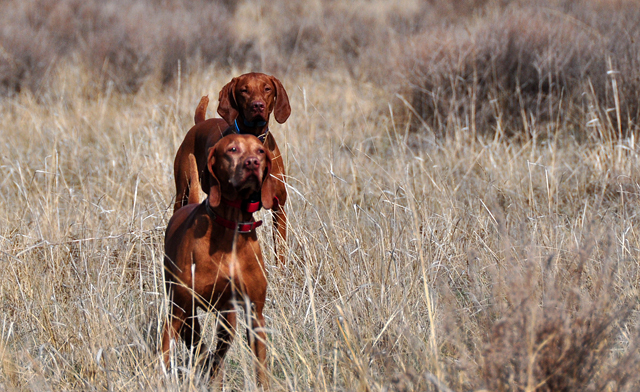 The Vizslas in this video clip are 3 and 4 years old and have had extensive training. Her “sister”, Trip, was honoring her point. Housemates are generally more competitive with each other. Amante already finds it very difficult to hold to a release. She can handle other dogs honoring her better than when her “siblings”/housemates are honoring her. I wasn’t ready–didn’t anticipate the scene as it was unfolding. I should have seen the gunners blocked Amante’s ability to mark and known she would likely need to adjust in order to mark the bird. Given this, combined with her “antsy-pants” problems with standing after the shot, I should have anticipated she would break and should have been ready to correct her mistake. It would have been a most valuable lesson for Amante had I gotten a good, well-timed correction in. Instead, the behavior we’re working to fix–of her breaking at/right after the shot– was reinforced (because she loves retrieving and got to do so on her terms instead of ours). Written by Mel Reveles and Aaron Davis of www.FusionVizslas.com. We are proud to be founding members of the Rocky Mountain Vizsla Club–”The Specialty Vizsla Club of Colorado”, and members of the Vizsla Club of America. We are also members of the American Kennel Club’s Breeder of Merit Program.